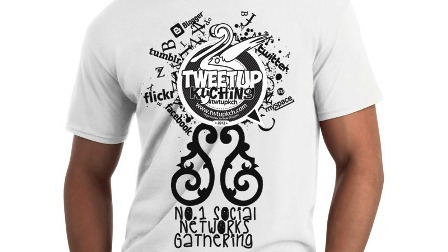 Home Bloggers Activities Get your official #TwtUpKCH tshirt at RM23 NOW! Get your official #TwtUpKCH tshirt at RM23 NOW! The official #TwtUpKCH t-shirt was announce last few days, and now, the organizers of Sarawak’s Biggest social media event Sarawak Bloggers Society have also announce the pricing and method of payment. According to a statement issued, the t-shirt will be sold at RM23 for those making pre-orders, and the exclusive design will only come in one colour which is white. After 2 November 2012, the normal price would be enforced which is at RM25. At the time of this post, orders have been received from numerous parts of Malaysia including peninsular Malaysia, Sabah and Labuan which means that the t-shirt now has gone nationwide in terms of orders. A representative of Sarawak Bloggers also said that the t-shirt would only be sent out in November as printing is now in progress. Those interested to buy the t-shirt are strongly urged to pre-order to ensure their sizes are available. Stocks are limited, and the t-shirt will not be reprinted after #TwtUpKCH. To know more, please visit www.shop.sarawakbloggers.com.